As the operator of the BMBTO you become half of the machine itself. Your job is simple but profound. The User is working hard at picturing a better Toronto. You are focusing on connecting yourself, the User, and Operator #2 together and amplifying the thoughts of the group. 1. Lie on the raised platform and relax. 2. Open your mind, hear the sounds around you. 3. Feel the presence of the User and Operator #2. 4. Expand your mind. Feel their presence even more. 5. Let your consciousness fill the tent, and feel the others existing inside your expanded mind. 6. Let the consciousness of the User and Operator #2 mix with your own until it is one. 7. Gather energy from yourself, the air, and the earth, and channel it into your collective consciousness. Tips: Keep it simple. Feel it out. Hold in your mind the words, “connect” and “amplify.” Relax and have fun. As the operator of the BMBTO you become half of the machine itself. Your job is simple but profound. The User is working hard at picturing a better Toronto. You are focusing on projecting the thoughts of the user into the space around you, the city, and the universe. 3. Feel the presence of the User and Operator #1. 6. Expand your consciousness beyond the tent. 7. Imagine yourself like hose projecting thoughts into the atmosphere. 8. Let the energy and consciousness of the User and Operator #1 move through you. Tips: Keep it simple. Feel it out. Hold in your mind the word “project.” Remember the others are generating a lot of energy in their work, all you have to is direct that energy. Relax and have fun. As the user of the BMBTO you are in the driver seat. Your job is simple but profound. Simply imagine Toronto as a better place. Let the Machine do the rest of the work. 1. Sit in the empty chair and relax. 2. Think about the City of Toronto. 3. Imagine the city as a better place than it is today. 4. Imagine the city as an even better place, perhaps a perfect city. 5. Hold your vision of a better Toronto in your mind, make it as real as possible. 6. When you are finished, open your eyes and stand up, but remember your vision. Tips: Think of specifics, see yourself in the better Toronto, see your friends and family, imagine how they feel living in this better Toronto, imagine what would come next, how could Toronto be even better? If the whole city is too hard to imagine, try just your neighborhood, or just your block. This participatory art project makes you the operator of an experimental human machine designed to improve the city with the powers of the mind, imagination, concentration, and will. At first glance the Better Machine for a Better Toronto (BMBTO), doesn't look like much. 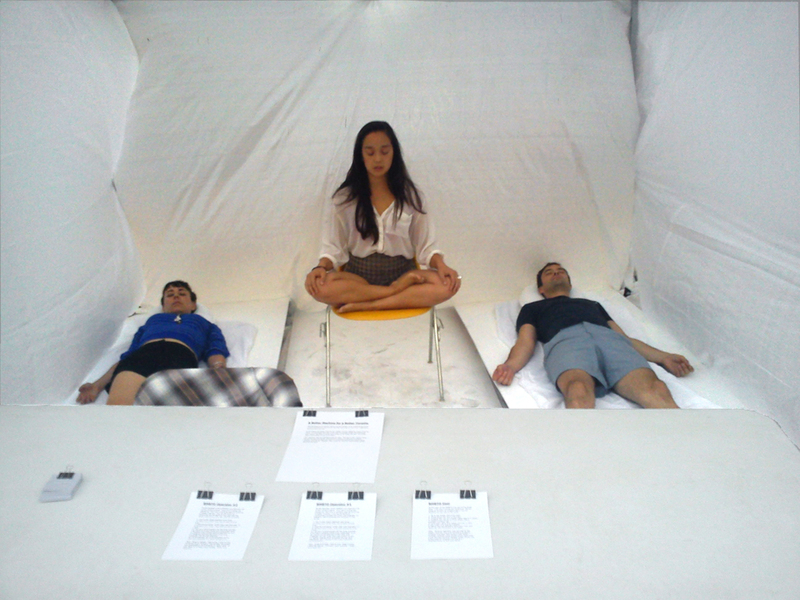 A near empty tent with a chair and two people quietly lying with their eyes closed. But there is much more going on the meets the eye. The empty chair is for waiting for you to sit down. The “machine” has two operators and one user. The user of the machine takes the empty seat and silently, with intention, thinks and dreams of a better Toronto. The two operators are there to collectively project and amplify these thoughts and dreams. Together, they create an intention exponentially greater than anyone alone.